I discovered Tim Federle because of his Nate books, which I devoured back in 2014. 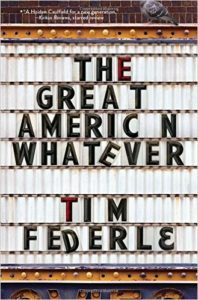 I was psyched to find a new book out from him this spring, The Great American Whatever. Just like the Nate books, I eagerly tore right through this book. Whatever is the story of Quinn, a sixteen year old who hasn’t been able to get over the death of his sister, Annabeth. He’s been a shell of himself ever since and at the start of the book, Geoff, his best friend decides it’s time Quinn gets back out into the world. In a whirlwind week, Quinn gets out of the house, meets and sorta dates a hot guy, and starts to rediscover the future he thought he’d given up when Annabeth died. You see, Quinn wrote movies and Annabeth directing with Geoff as the star. With no Annabeth, Quinn lost his drive and passion for screenwriting. Federle layers this story so perfectly as we meet Quinn and go on the week’s adventures. It’s amazing how much can change in so few days, and Federle picks just the right moments to focus on in Quinn’s awakening. Best of all, it’s not all-at-once. For every step Quinn takes for a while, he can end up going backwards too. It’s not all easy and Quinn’s internal dialogue rings true as he debates with himself about what to do. Plus he’s got to deal with some revelations about childhood memories as well as some secrets that were kept from him. I laughed and cried several times over the course of reading. Federle hit all the right emotional notes, both ones I expected and ones I didn’t. This is a great YA book about re-finding yourself that teens and adults should love.